If you're easily distracted when praying, you're not alone. In fact, if you struggle to pray in the first place, that's not unusual either. Tim Chester tells us how we can be great pray-ers. And he admits that that's a really bold claim. Tim looks at: why prayer is easy (how we pray), why prayer is difficult (why we pray) and the arguments and priorities of prayer (what we pray). Prayer is a child asking her father for help. And that's not beyond any one of us. You Can Pray by Tim Chester was published by IVP in February 2014 and is our 15215th best seller. 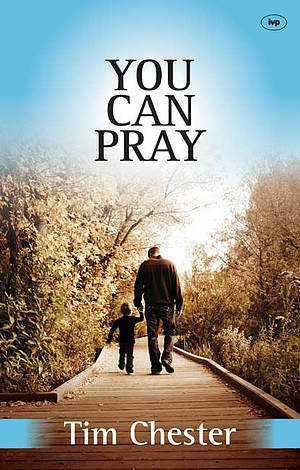 The ISBN for You Can Pray is 9781783590841. All Christians are supposed to be able to pray but there can be few who do not find it difficult. Tim Chester's book is a goldmine of positive encouragement to everyone who gets distracted when they pray, find motivation difficult or just don't know how or what to pray. If you find prayer difficult then this book is for you. Chester suggests that the secret of successful and satisfying prayer is to know that God the Father loves to hear us pray, that God the Son makes every prayer pleasing to God, and that God the Holy spirit helps us to pray. It is not something we must perfect or achieve but something, however wavering, to offer to God in trust. The book is in three parts: Why prayer is easy (How we pray) - with references to Luke's Gospel; Why prayer is difficult (Why we pray) - with references to Lamentations; and What we pray (The arguments and priorities of prayer) - with references to the Lord's Prayer. All in all this is a most helpful and valuable book on the subject. It should be on every church library shelf and could be a useful study guide for church groups. I loved the phrase "Prayer, is a child asking her Father for help". Of course there is more to it than that, but that's not a bad place to start. It's so easy to get caught up on guilt about not praying, or not praying well enough or fervently enough. And such guilt often causes us to give up on prayer, or alternatively into an unhelpfully driven approach. This is an easy to read, but very biblical book. I've found it so helpful and warmly recommend it. Got a question? No problem! Just click here to ask us about You Can Pray. "The subject of prayer can raise profound questions, fears, guilt and frustration in us all. Tim Chester answers with rich theology and practical wisdom. As ever he is Trinitarian, gospel-shaped and pastorally-hearted. By the end you won't just believe the title, you'll rejoice that, in Jesus, You Can Pray." - Glen Scrivener, an ordained minister and evangelist. "You may be thinking 'not another book on prayer' and so was I. What I found was a book that challenged and stretched how and what I pray for. It was a refreshing reminder of the fundamentals of prayer and the end focus of glorifying God; however he chooses to answer our prayers. Whether you've read a lot of books on prayer or none - this is well worth the read." - Charmaine Muir, Minister for Workplace, All Souls, Langham Place.